Last week I had the pleasure of attending the second annual Ladies on the Green Golf Classic at Victoria Golf Course in Edmonton’s river valley. Started by eight local ladies who love the idea of a charity golf tournament, but who don’t love the game, the day combines women who like golf with those who may not into a stylish afternoon packed with some golf, lots of socializing, tasty nibbles, and of course champagne. The fun is all in support of a very important cause; Edmonton’s Zebra Child Protection Centre, which is a community of agencies, helps to improve the lives of children impacted by abuse. The day offers up two options: play a round of 9-hole golf followed by dinner and festivities, or join later in the day for cocktails, a 1-hour group lesson with a golf pro, which finishes up in time for dinner and the festivities. I managed to win tickets for the latter option through Where Edmonton Magazine, and my friend Michelle was more than happy to join me with my silly stylish antics. The website said heels and dresses were completely appropriate – so that’s what I went for. When we arrived we took advantage of a complimentary touch up at the Armani lipstick bar. And then we aerated the soil as we headed over to the driving range for the group lesson with a golf pro, and where a Glenmorangie Scotch bar was conveniently located. Some people were really keen to take in the lesson. 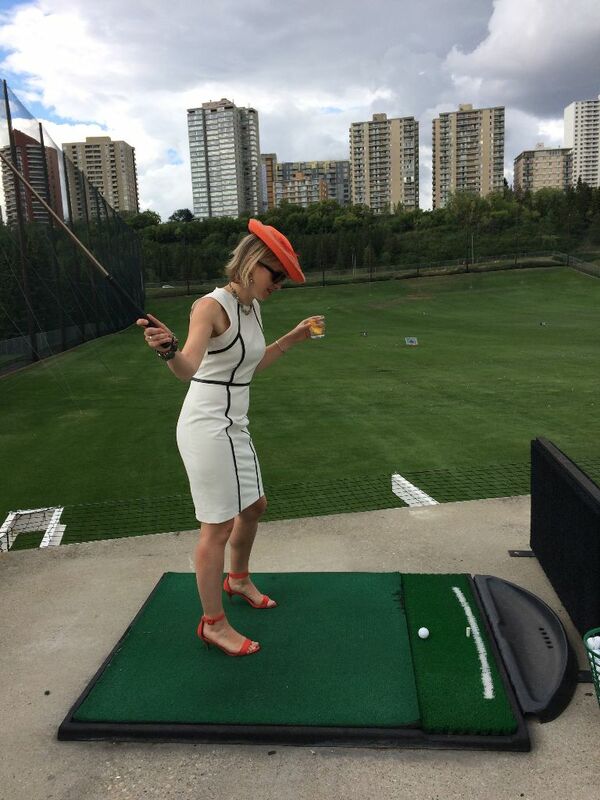 I was only interested in the photo opportunities (and to prove to the golf pro that I could take a swing in heels). I had more than a few swing & a misses. Michelle on the other hand, who has taken lessons from the pro leading our lesson, had a more effective swing than I did. We snuck out of the lesson early, but not before taking advantage of the gift bags! The ladies were finishes up their 9-hole games and the main tent was starting to fill up. Complimentary wine always helps the silent auction bids go higher. I joined the line up to have my hair touched up at the Roxx Salon hair braiding station and nail bar. Outside I found my lovely friend Christy, one of the event organizers, conveniently located next to the champagne table. Inside we were treated to delectable delights from Dogwood Cafe. The Victoria Golf Course clubhouse cafe is the newest venture from the Brad & Cindy Lazarenko, the duo behind Culina Restaurants & Catering. And CBC’s Mark Connolly was available in case any lady needed a top up. Although I didn’t participate in the actual golfing, I thought the event was awesome. 175 women came together for a fun day outdoors, raising over $45,000 in support of the Zebra Child Protection Centre. I can only imagine that the 9 holes of golf was a riot. With apparent indulgences at each hole, and members of the Edmonton Police Service on hand to take shots for you – Ladies on the Green is the perfect opportunity to get out and have fun on the course. The event is sure to be a sell out again next year – stay tuned to @ladiesotgreen for information on the 2016 social event on the Edmonton golf scene. Next PostPitstop in Torrington, Alberta? Gopher it!